The Hariyo Ban Program works in two priority geographical areas: the Terai Arc Landscape (TAL) and the Chitwan-Annapurna Landscape (CHAL). The Hariyo Ban program is focusing in the TAL districts of Kanchanpur, Dadeldhura, Kailali, Bardia, Banke and Dang. It is also focusing in Lamjung, Tanahun, Kaski, Syangja, Manang, Chitwan, Nawalparasi and Gorkha in CHAL. Programs related to wildlife poaching and trafficking will include two corridors namely Kaligandaki (Mustang, Myagdi, Baglung) and Trisuli (Rasuwa, Nuwakot, Dhading) in addition to the above mentioned districts. The locations were identified by taking into account an analysis of socio-economic and biological information for both the landscapes. Broad criteria for prioritizing the intervention sites included current status of biodiversity and ecosystem services, vulnerability to climate change, and complementarity with other donors, programs and projects. The Terai Arc Landscape (TAL) stretches between the Bagmati River in Nepal and Yamuna River in India. The TAL area within Nepal lies between the Bagmati and Mahakali Rivers and includes six protected areas and two Ramsar wetland sites covering an area of 23,000 km2. TAL is one of the most biologically important areas on earth. Home to tiger, rhino, elephant, gharial and Gangetic dolphin, it contains the world’s tallest grasslands, and riverine and hardwood sal forests. It is rich not only in biological diversity but also culture. There are over 45 different ethnic groups including indigenous Tharu, Bote, Sonaha, Mushar and Chepang groups with a wide range of cultural and religious practices. Why are we working in TAL? TAL has several critical sites, including the fragile Churia ecosystem (the youngest of the Himalaya foothills). TAL has important corridors and bottlenecks that connect isolated core protected areas used by rhinoceros, tiger and elephant. The settlements close to these areas are inhabited by poor indigenous communities with limited livelihood opportunities and high dependency on forest resources. Often these communities come into conflict with wild animals incurring significant human casualties, loss of crops and livestock, and damage to property. Encroachment and degradation of forest, forest fire, poaching and timber smuggling, and increase in invasive alien plant species is seriously threatening the biodiversity of TAL forests and the livelihoods of those who depend on them. Aquatic life is affected by pollution, poisoning and excessive harvesting of river and wetland resources, as well as large infrastructure developments. Many areas and people in TAL are vulnerable to climate variability and climate change. Hazards due to complex causes include widespread flooding, frequency of fires, unpredictable changes in the monsoon and rising temperatures, with impacts on agriculture. The Chitwan-Annapurna Landscape (CHAL) falls partly within the Sacred Himalayan Landscape (SHL) that stretches from Bhutan in the east to Nepal’s Kali Gandaki River in the west. 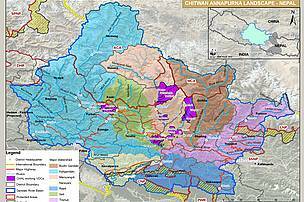 CHAL itself is bounded by the Gandaki river basin. It exhibits much scenic beauty, ranging from the rain shadow of the trans-Himalayan area and the snowcapped mountains of Annapurna, Manaslu and Langtang in the north, descending southwards through diverse topography to the mid-hills, Churia range and the flat lowlands of the Terai. It contains seven major sub-river basins: Trishuli, Marsyandi, Seti, Kali Gandaki, Budi Gandaki, Rapti and Narayani. CHAL has high biodiversity value and rich natural and cultural heritage. It is an important transit route for migratory birds and is home to endangered species like snow leopard, red panda and Himalayan black bear. CHAL has a human population of over four million people, many of whom live in very isolated places with poor access to markets, and who are very dependent on forest resources and ecosystem services for their livelihoods and wellbeing. Tourism is a major economic activity in the region. Why are we working in CHAL? Biodiversity is seriously threatened in many parts of CHAL, including poaching of wildlife species such as the endangered snow leopard. Much of the national forest in the middle and lower CHAL is fragmented, including sub-watersheds and potential corridors. This is mainly due to encroachment, over exploitation of forest resources, livestock pressure and infrastructure. Human-wildlife conflict is common resulting in negative local attitudes towards key wildlife species. Freshwater biodiversity is also severely affected due to construction of hydro dams, water diversion and extraction, sand and boulder mining, electro-fishing and fish poisoning in most of the major rivers. The impacts of climate variability and climate change on people and biodiversity are poorly understood in this area, though it is known that temperatures are rising faster at higher altitudes. Severe drought, unusual rainfall patterns and heavy landslides have adversely affected both human and ecological communities in the landscape. Disclaimer: The Hariyo Ban Program is made possible by the generous support of the American people through the United States Agency for International Development (USAID). The contents of this website are the responsibility of WWF and do not necessarily reflect the views of USAID or the United States Government.